IGUS is an international group of scientific experts dealing with the explosion risks of unstable substances. IGUS was set up in 1962 with the aim to harmonise test methods used by different countries to identify and quantify the explosive properties of unstable materials. Since then, its scope has widened to thermal stability, reactivity and flammability of all kinds of unstable and reactive substances. Over the years, IGUS has continued to offer scientists who are advisers to their governments, and others, a forum to exchange data and information. This exchange takes place primarily in support of the development of classification regimes to protect society from hazards of unstable substances and to remove barriers to international trade. 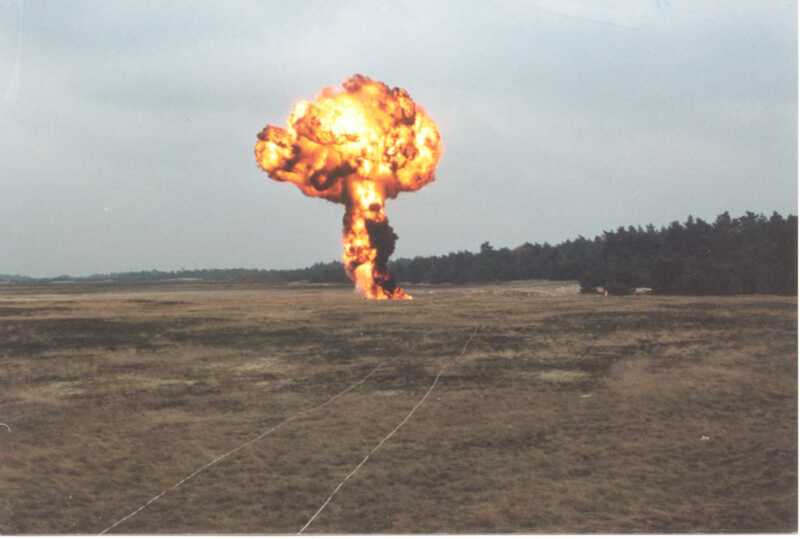 One of the main goals of this exchange has always been to understand and quantify the resulting effects (such as the explosion effect as shown right) from accidents involving dangerous goods. in order to improve safe manufacture, handling, transport and storage of various kinds of dangerous materials. Schemes and criteria for the classification of dangerous substances come about through the negotitations of policy makers at meetings of international bodies responsible for agreements. These policy makers and international bodies are supported by technical experts. Whilst these experts support their colleagues' national positions, it is also extremely important that such technical experts have the means to exchange and discuss freely technical concerns in detail so that at such meetings progress can be made. One such forum is IGUS, brought into being more than 40 years ago. Their 'unstable substances' (and their concerns) focus mostly around materials like explosives, fireworks, flammable solids, self-heating substances, self-reactive substances, oxidisers and organic peroxides. Quantifying the dangers inherent in energetic materials and establishing controls for them brings together many scientific disciplines. International collaboration by national laboratories on test method development does occur and is vital to ensuring rigour in hazard assessment, but the process is slow. IGUS however has contributed significantly in this area. IGUS members devote considerable time to examining the different test methods to identify and improve upon the best methods that discriminate materials with explosive, flammable and oxidising properties. A vital feature of any test that may be used for classification is its reproducibility and this aspect is probed, sometimes, by 'round robin' testing. If tests are poor in this respect, then no matter how 'sensible' classification schemes appear, agreements on classification between national authorities will not occur. Members of IGUS are experts from the OECD countries insofar as they are members of government laboratories and organisations or scientists who are involved in research and are governmental advisers on a permanent basis. Other organisations (e.g. universities) may also apply for membership, under restricted conditions. Membership is open to scientists from the OECD countries who fulfill the above conditions. Scientists from non-OECD countries may apply for membership as independents if similarly engaged. Parts of working group meetings are also open for experts from industry, after being invited by the chairman. Independents and industry representatives are not eligible for office. There are relatively few organisations where technical experts can share views and opinions at a formative stage and exchange information that benefits their institutes programmes, but IGUS in one such body. The relationships and respect among the members built up over the years enables valuable interchange to continue. Increasingly, the attendance of policy representatives and inspectors at IGUS meetings as well as joint open meetings with industry and universities speak for itself in respect to benefits perceived. The links forged between the national bodies in IGUS in the past years still provide a good basis for continued discussion and collaborative work to realising the aims of ensuring the safety of people and reducing barriers to trade via harmonised testing and classification schemes. Tests and criteria for fireworks, the aim being to enable legislation to be enhanced by harmonisation of firework types and safety parameters through wider application of a CEN standard currently being developed. Improving on database compilation, tests and criteria for self-reactive and thermally unstable energetic substances, building on and supporting official international organisations attempts at global harmonisation of classification regimes; improving the description of test methods to assist a third-party certification of bodies using them. Correlation of test data from several institutions to enable comparisons to made so that some tests might be agreed as redundant, or better for solids than liquids, etc. Continued information exchange on accidents and incident: to promote safety awareness and highlight any shortcomings in the tests and criteria regimes. Continued examination and development of methods to predict, rank and scale the compounds, phlegmatized products and fuel/oxidiser mixtures. Industrial explosions knowledge advancement in the areas of dispersion modeling, obstacles effects, blast yield, deflagration speeds and transition to detonation. 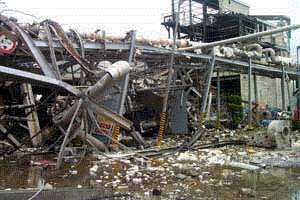 Physico-chemical aspects affecting self-heating, deflagration and detonability of ammonium nitrate in manufacture. IGUS continues to offer its members, and other participants in its meetings, a valuable, independent and globally operating forum to exchange data, information and experience in relation to the above-mentioned topics as well as other items that may arise as a result of changing regulations, new studies and incidents. See also the Terms of Reference. The information on this page is partly extracted from: Dr. B.J. Thomson, 'International co-operation in hazardous materials accident prevention', lecture held at the International Workshop on Safety in the Transport, Storage and Use of Hazardous Materials, Tokyo, Japan, 11-13 March 1998. Also published in Journal of Loss Prevention in the Process Industries, Vol. 12 (1999), p. 217-225.